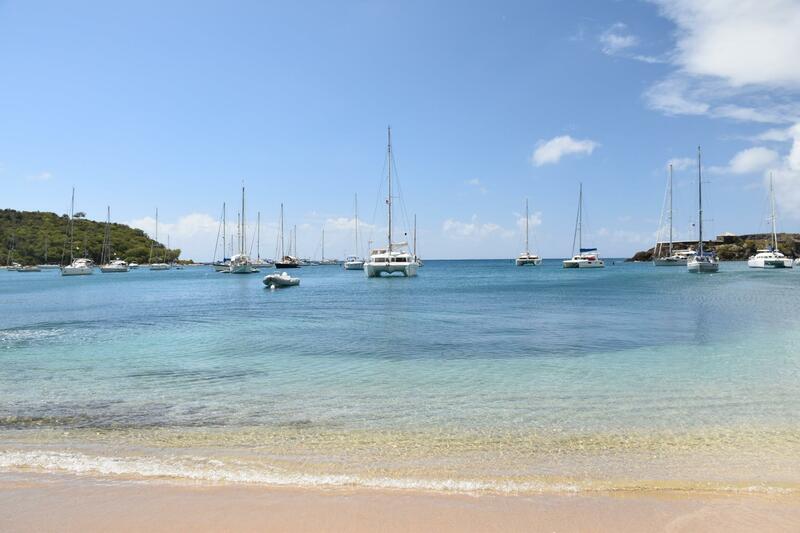 We left Deshaies at first light on Sunday morning bound for English Harbour in Antigua. It took us 40 minutes to clear the wind shadow of Guadeloupe and start some real sailing. At 45 degrees to the wind we could just make the line we needed, whilst doing 5-6 knots. A squall came half way across and we had to put in a reef, but that didn’t slow us down any more. We got to English Harbour just before 3pm and we were surprised by how small the three different choices of anchorages were. We’d gone to English Harbour in preference to Falmouth because the e-SailClear system only had English Harbour as an option. In reality we could have gone to Falmouth as it’s only a 10 minute walk around to the same Customs and Immigration office at Nelson’s Dockyard. 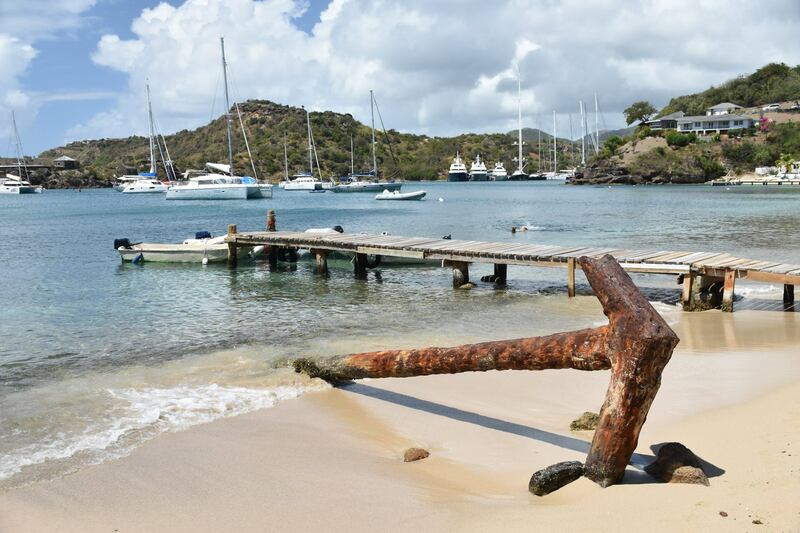 After checking out all three anchorages in English Harbour we settled on Galleon Beach, where we were just able to sneak in – as there were a lot of yachts in a small space; and to top it all off, the holding was not the greatest with a rubbly bottom. We ended up putting our secondary Fortress anchor out, shackled to our primary Rocna on 7m of its own chain to make sure we stayed put, especially since the wind was picking up during the week. Shortly after getting our anchor set, Maisie dinghied over and we had a drink or two on the bow. Then they disappeared on a hot date at a local restaurant; and Dee and I headed for the hills. Shirley Heights on a Sunday evening is the place to be. There is a steel band to start with and then when the sun goes down there was another band with lots of dancing to be done. In between there was some great cheap barbecued food. It’s an Antiguan Institution on a Sunday Night and it turned out to be loads of fun. After we’d danced the night away, we caught a $10 taxi down the hill and ended up at The Cheeky Marlin, a beach bar run by Nick from Port Adelaide. Nick’s a great guy and it made a perfect end to a perfect night. Nick is supposed to shut the bar at sunset and he was still trying to do it at 10pm when we arrived. He thought he had finally managed to kick everyone out, but the rain came and we all raced in again for more drinks. We spend the next day, exploring English Harbour and Falmouth, especially the chanderlies that were quite numerous. Both Falmouth and English Harbour are full of boats…from old classical boats and big new horrible looking motor yachts. The museum at the historic Nelson’s Dockyard was a highlight as was the bakery behind it. Yum! Then it was off to Maisie for drinks with Martin and Rita, as well as Ken and Jenny from Lady Rebel, who had just arrived. After drinking a few too many red wines, we added the term “Maisied” to our vocabulary. It made getting up early to pick up the hire car a bit more challenging than usual. Hiring a car in Antigua is a bit more expensive than you expect as you need a temporary local license that sets you back another $20. We managed to see most of Antigua driving around in a day. The beautiful beaches were the highlight – just a real pleasant island to drive around. Antigua had a couple of really good walks. The first we did was up to Shirley Heights for the obligatory photo down to both harbours. From here we checked out the national park with a few other forts and an impressive interpretive centre, complete with a film presentation. From there, it was a short drop down to Galleon Beach, our original starting point. The next day, we were on foot again across to the other side of the entrance to English Harbour where there is another fort, before trekking across the range to Pigeon Beach at the entrance to Falmouth Harbour. Then it was a short walk back into Falmouth. Sitting on Maisie, we decided we needed to organise a bit of a mini B50 reunion at the Yacht Club. 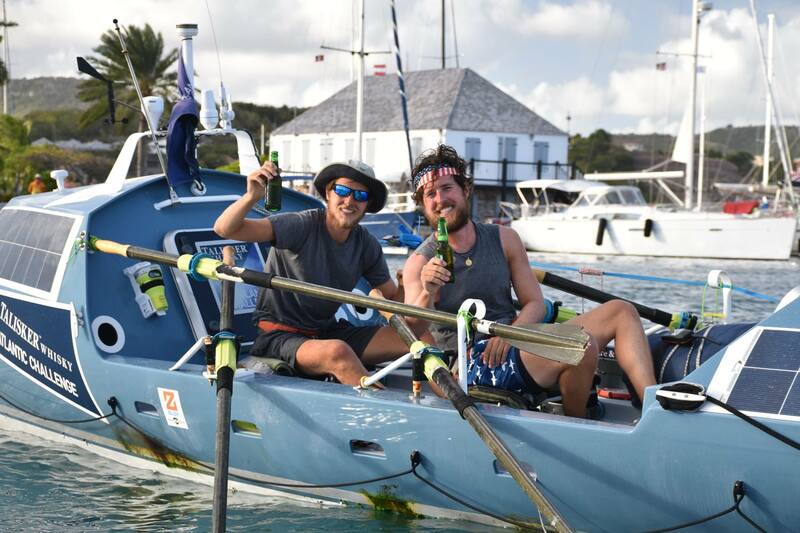 As well as the usual suspects from the previous drinking session, Thetis joined us from the Catamaran Marina across the bay in Falmouth and Peter, Jenny and Bill taxied down from Jolly Harbour to join in the festivities. A great night catching up with everyone. Sitting on La Mischief one afternoon, we saw a commotion out in the entrance channel and out came the binoculars. 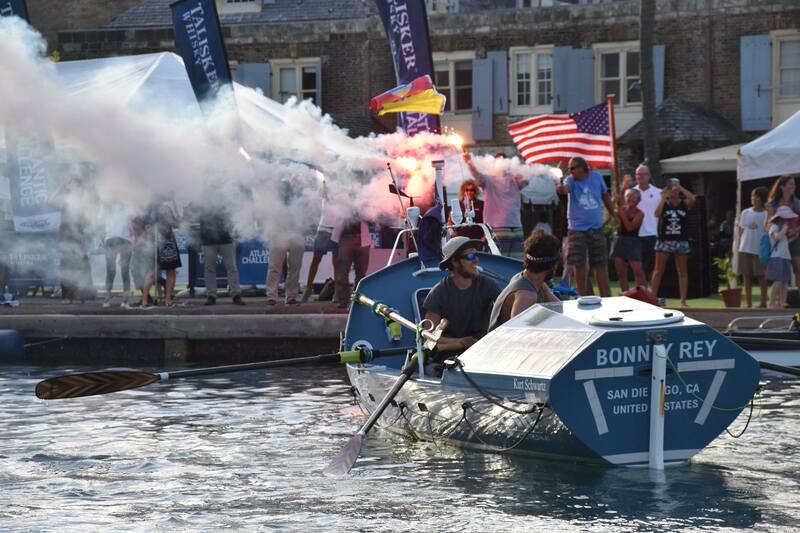 We quickly worked out that it was a couple of competitors from the Talker Whisky Atlantic Challenges, a rowing race across the Atlantic.The idea of the Atlantic Challenge race came to Sir Chay Blyth whilst he was rowing the Atlantic Ocean in 1966 with John Ridgeway. We met Chay sailing in Turkey in 2015. We took the dinghy out to see them and when we worked out they hadn’t had a beer in 3 months we rushed back to La Mischief to grab a couple for them. Our last night in Galleon Beach was spent at the Cheeky Marlin eating burgers and watching Captain Ron on an upturned table on the beach with a white table cloth for a screen. The rain was a bit of a problem but a tarp over the projector did the trick. A great last night. With the cricket fast approaching, it was time to head off to Jolly Harbour on the West Coast to get ourselves a bit closer taxi ride to Sir Viv Richards Stadium to hopefully see the West Indies beat England! This entry was posted in Antigua and tagged falmouth, Galleon Beach, nelsons dockyard, Shirley Heights, The Cheeky Marlin by stull61. Bookmark the permalink.